Wild moments. The Monster Energy Cup is typically full of them. 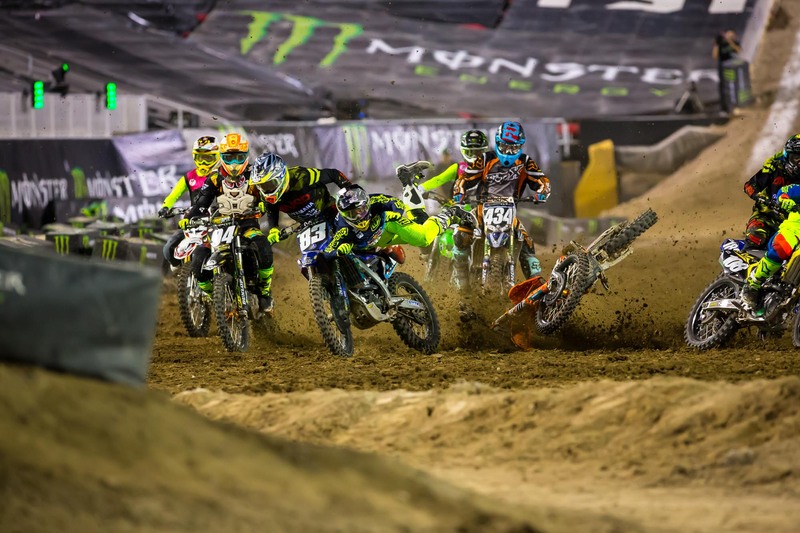 From Ryan Villopoto winning the $1 million in the race’s first year to Ryan Dungey resorting to shifting his KTM with his hand after damaging his shifter two races in a row, it’s a race that never seems to be short on entertainment. 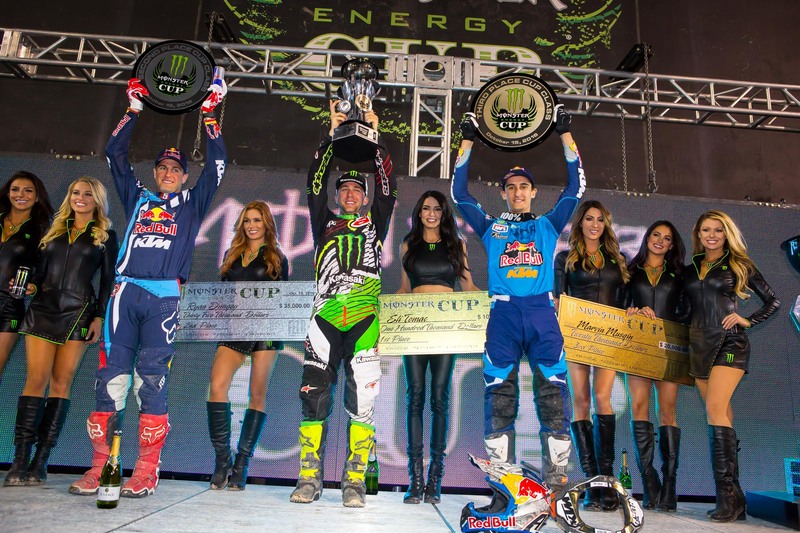 So when the 2016 Monster Energy Cup arrived, fans were primed for yet another crazy night of racing. But did this year’s race deliver? Let’s dive into Saturday Night Live to find out. If you watched the first half of the night and flipped off the TV, you’d probably say this wasn’t one of the better nights in MEC history. Ken Roczen took the lead right away in the first race and took off for the undisputed win, just like we’d watched him do so many times over the summer during the Nationals. 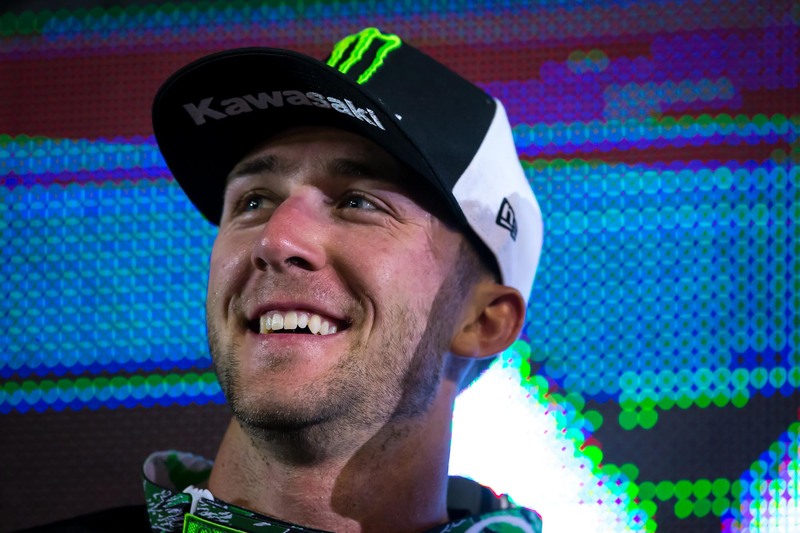 It wasn’t a matter of his closest competitors getting buried off the start either, as Eli Tomac started in third and moved past Blake Baggett into second without too much trouble. But even with clear track he wasn’t able to cut into Roczen’s lead, and Roczen’s gap just continued to grow until the checkered flag flew. He was clearly the fastest rider on the track, and the buzz of a perfect sweep and a $1 million paycheck started flying around before the first race was even over. When the second main event got underway it was again Roczen in control, and while Tomac did indeed keep him closer this time around, even getting almost within striking range, Roczen responded and never let Tomac get close enough to make anything happen. It ended up not actually mattering though, as Roczen made a mistake in a rhythm lane and went over the bars hard in what looked like an extremely violent crash. Somehow he escaped the crash without getting hurt but was unable to get his bike going again, which ended his race. Ryan Dungey has never won the MEC, but thanks to Roczen’s big crash in the second race he had a serious shot at it. In order to win he needed to beat Tomac by two spots, and when Tomac got buried on the start it looked like Dungey might be able to get it done. 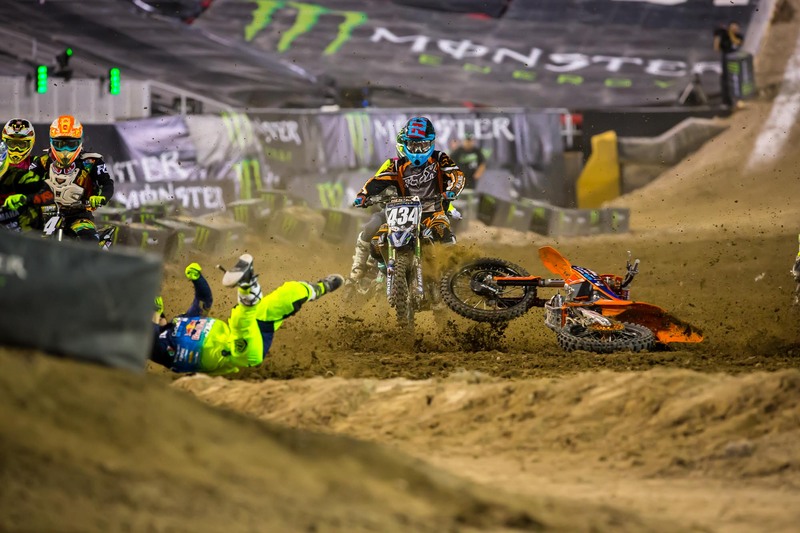 But Tomac wouldn’t give up easily and sliced through traffic, eventually finding himself on Dungey’s rear fender. He made the pass, but in the final stages of the race Dungey got him back and went after Musquin in second. Afterward Tomac even admitted for a moment in the third race he thought he just might be blowing the win. Dungey didn’t get Musquin, but he was very close on the last lap. “I was wishing we had radio communication so I could talk to Marv and ask him to let me by!” Dungey joked afterward, but was quick to point out nothing like that would ever happen, and that the team had no plan in place for a situation like that. 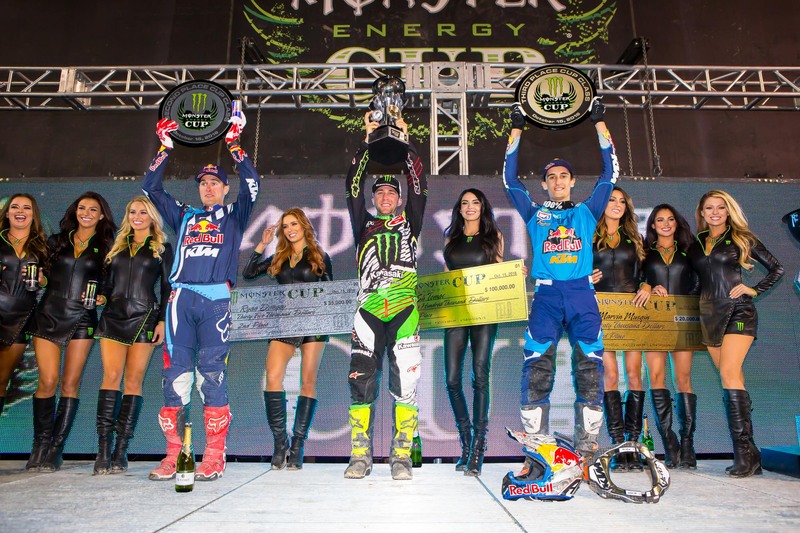 Probably not the night Chad Reed was hoping for. 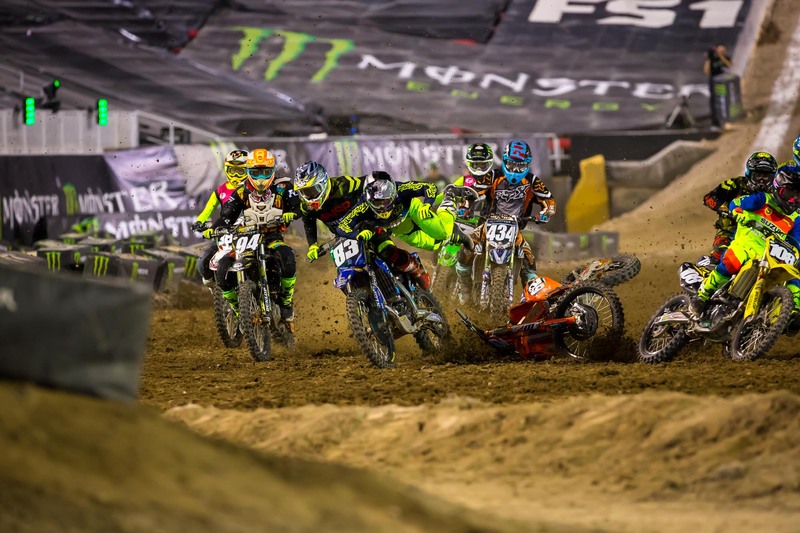 The veteran had a minor collision with the finish line structure during practice and almost got run over by a pack of motorcycles in the third race when he cased a jump in the rhythm lane and went down on the first lap. Luckily he was okay and managed to scramble out of the way before getting chewed up by a bunch of fresh Dunlops. He ended up going 7-4-12 for eighth overall. 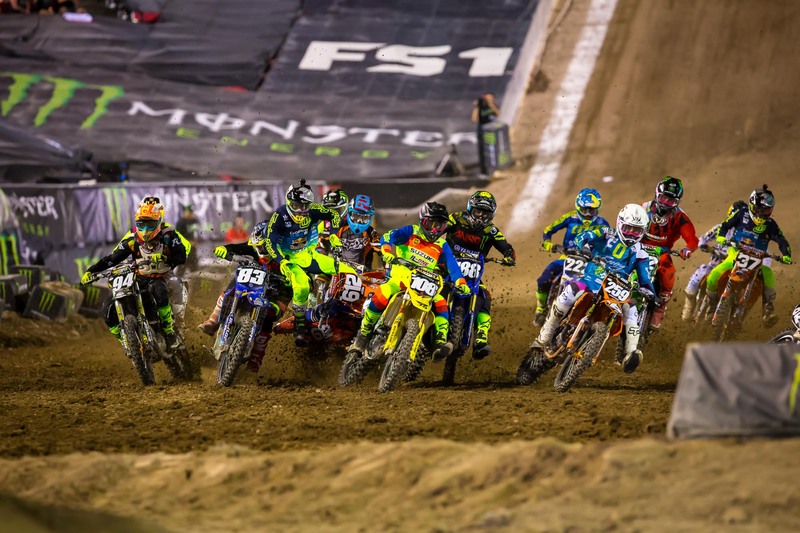 In the Amateur All-Stars races Cameron Mcadoo had an absolutely fantastic night, despite having a problem in the first moto and finishing seventh. He won the second moto by a huge margin, and thanks to getting holeshots in both races, Toyota awarded him a brand new Tacoma. It’s a good thing too because after the race he told us his moto van just had a transmission go bad. 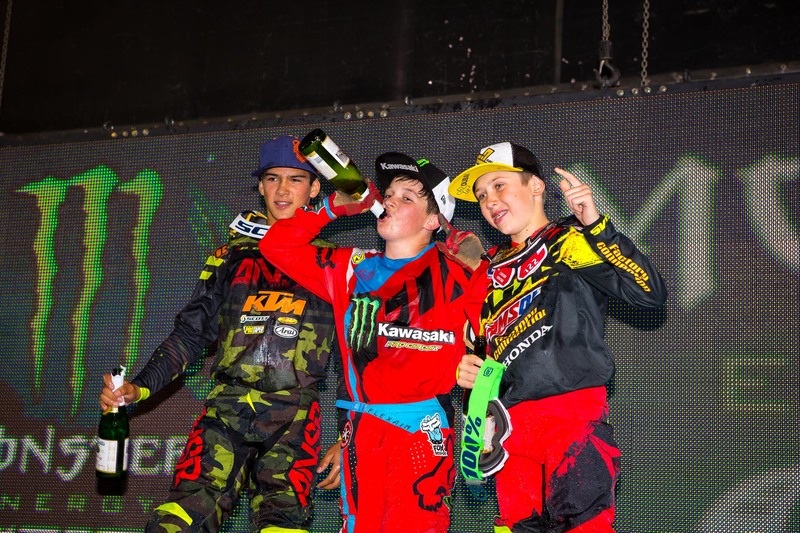 In the Super-Mini ranks Seth Hammaker looked great in the first race, winning by almost four seconds over Stilez Robertson, and in the second moto he was battling hard for another win with Robertson and Carson Mumford. He bobbled once, which allowed Mumford and Robertson to get away, but it wasn’t long before he was back on them. He made a mistake in a rhythm lane though and ended up going over the bars, which ended his shot at nailing down the win. Mumford and Robertson battled and exchanged spots for most of the race, but in the end it was Robertson who took the win. Don't worry, there's no alcohol in that bubbly! Nice rides from Aiden Tijero, left, Stilez Robertson, middle, and Carson Mumford, right. 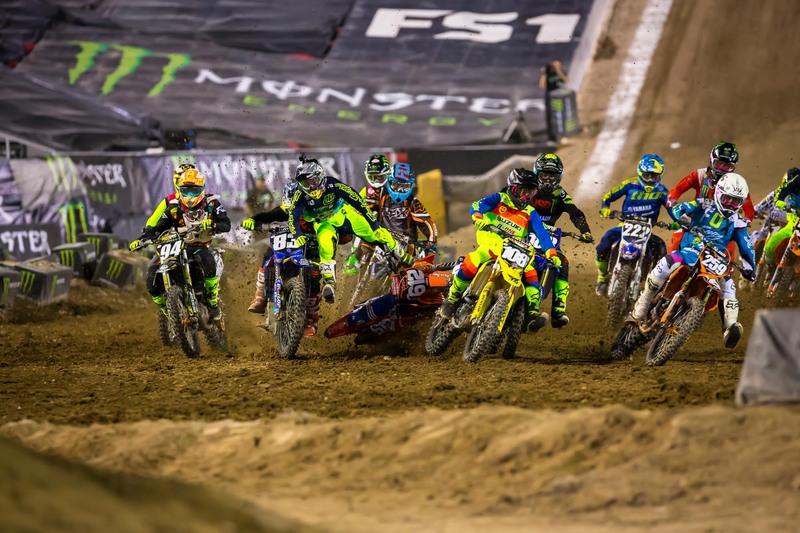 The Monster Energy Cup has a reputation for producing some wild racing and crazy moments, but with so many top racers missing the event this year there was a concern it might not be the same extreme spectacle we've grown accustomed to watching every October. Luckily those concerns were put to bed and we had yet another entertaining night in Sam Boyd Stadium. When the gate dropped in this one it was like the Nationals all over again—Ken Roczen nailed the holeshot and just took off for the win. Eli Tomac did his best to quickly get around Blake Baggett for second and go after Roczen, but even with clear track ahead of him Tomac couldn’t put a dent in Roczen’s lead, despite being the only rider to triple, triple, triple, triple, through the long rhythm lane. Roczen was the fastest man on the track in this race, and if he can keep riding like this we could be looking at another $1 Million winner. 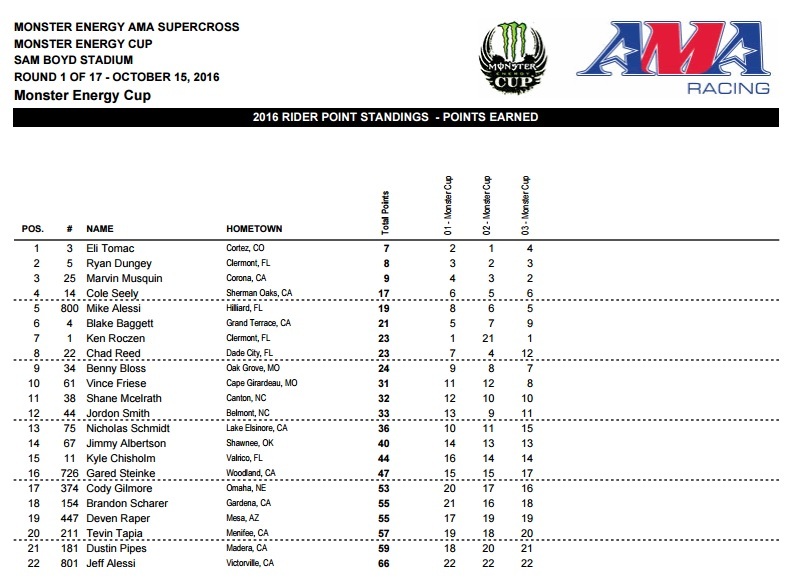 Behind Roczen and Tomac was Baggett, who dropped a few spots as the race wore on, allowing Ryan Dungey and Marvin Musquin by. 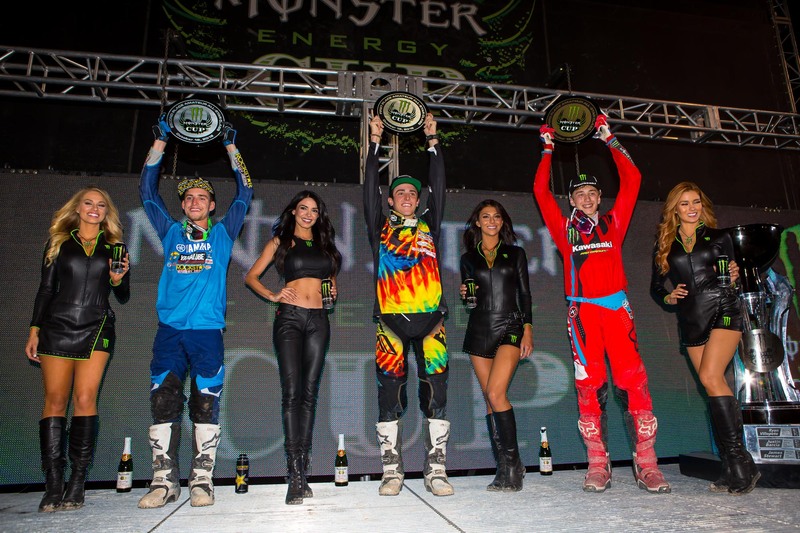 Baggett ended up fifth, with Cole Seely, Chad Reed, Mike Alessi, Benny Bloss, and Nick Schmidt rounding out the top ten. 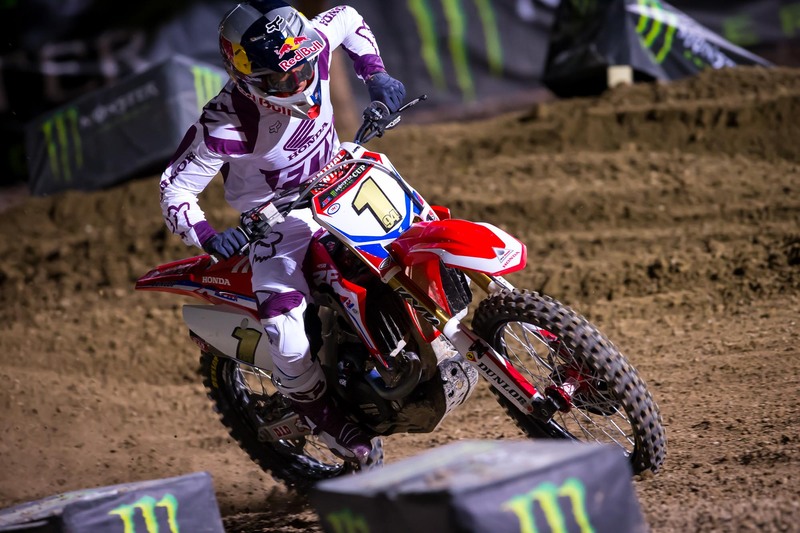 Remember that talk of Ken Roczen possibly going home with $1 million after he completely dominated the first race? Throw it out the window. Roczen was looking good for another win in the second main event when he made a little mistake in a rhythm late and got off rhythm, which resulted in a spectacular over-the-bars crash which allowed Tomac to blaze by for the lead and eventual win. Roczen, somehow unhurt, tried to pick his bike back up and get back in the race but was unable to get his Honda to fire back up. Tomac had been keeping Roczen a lot closer in this race than he did in the first, but wasn’t ever close enough to challenge for the lead. Ryan Dungey hung close behind Tomac and Roczen early on, but a few laps in started slowly losing touch. He finished second, and factoring in Roczen’s disastrous race, Dungey has a very real shot at winning his first Monster Energy Cup. 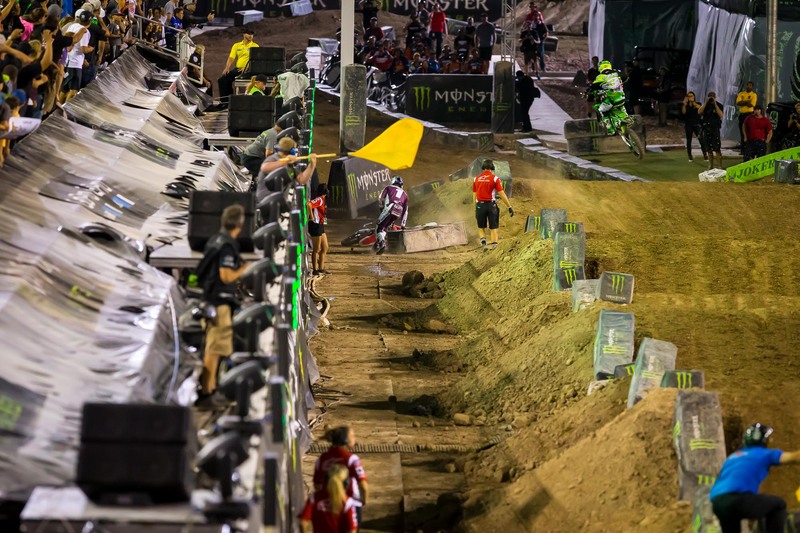 Ken Roczen nearly nabbed another holeshot but Chad Reed went up the inside and crossed the line first. One turn later he came up way short in a rhythm lane, crashed, and narrowly avoided getting run over by the pack. Up front Mike Alessi was leading with Roczen in tow, while Tomac got buried off the start and was in roughly tenth. 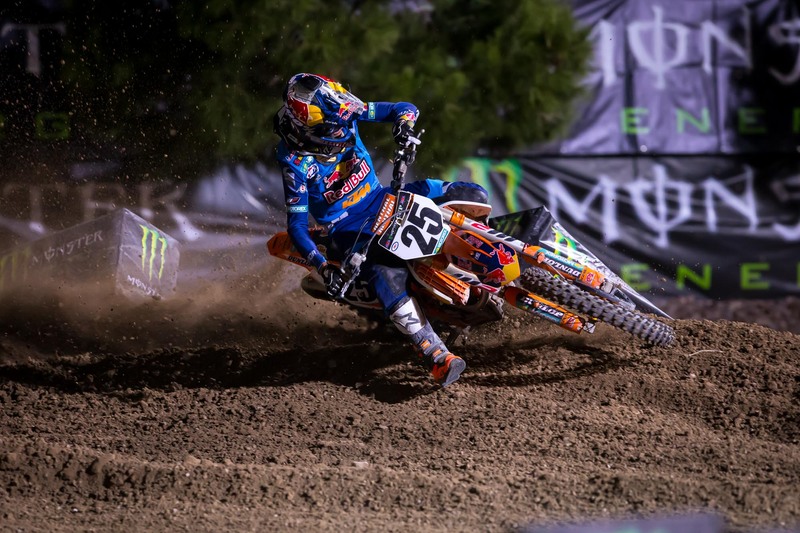 Dungey was in fifth, but moving forward. A few laps in Roczen took over the lead, but the real battle was for the overall between Tomac and Dungey. Dungey needed to put a bike between himself and Tomac to win the overall, but Tomac was determined not to let that happen. 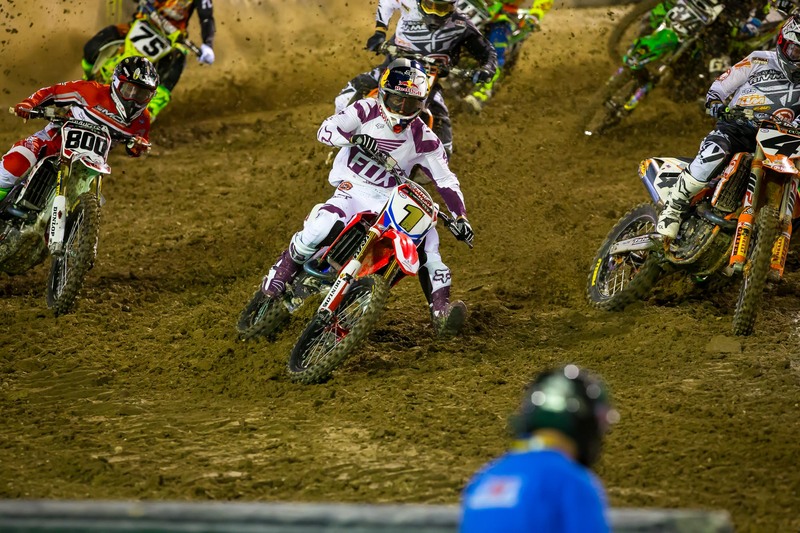 With five to go the two both went by Alessi, and shortly after Tomac went around Dungey, cementing the overall win. Or so it seemed. Dungey caught fire, passed Tomac and went after Musquin. Had Dungey gotten Musquin, which he nearly did on the final lap, he would have won the overall but Tomac was able to hang on. With the win he takes home $100,000.